The tourist, health- improving complex "Grand" invites you for elite rest. At us you will feel the comfort and coziness, will feel care and warmth from the side of staff. We hope that "Grand" will become for you the second home. 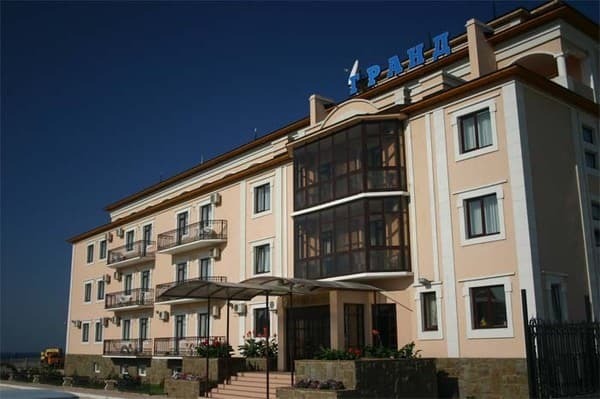 Choosing for relaxation in Sudak, hotel "Grand" you choose the best rest in our city! TOK "Grand" has the refined architectural structure, including two buildings with the general capacity of 44 comfortable rooms of deluxe and semi-luxe classes (in all rooms: a balcony; windows – a glass pack; the TV, a cable television; Internet access; internal telecommunication; the conditioner; a refrigerator, the hair dryer, the minimum set of ware; hot and cold water supply is constant) Restaurant, pool with the built in bar, a trading booth, a massage office, a children's playground. The tourist's complex "Grand" is not only high-class hotel, but also the special atmosphere and the European level of service. At your service: round-the-clock work of reception, booking, room service. The tourist's complex is provided with the round-the-clock professional guard. 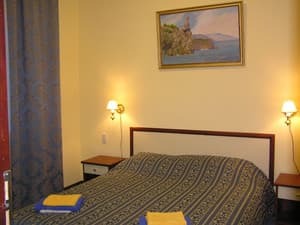 Description of the room: One-room double (view of Genoese fortress , a bed "Queen»(№ 119 **, 129 **, 139 **, 149 **, 211 **, 214 **, 221 **, 224 **, 234 ** 241 **, 244 **). 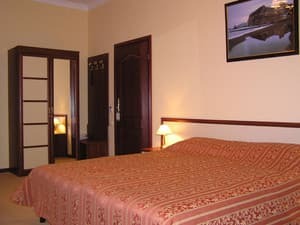 Single Double room (view of Alchak, sliding beds) (№ 113 *, 114 *, 123 *, 124 *, 133 *, 134 *). 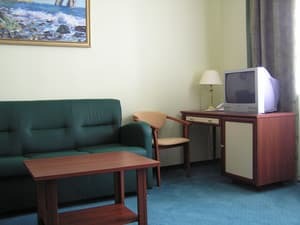 Description of the room: Double two-room suite (view of Alchak) (№ 115 *, 125 *, 135 *). Two-room double suite (studio) (view of Alchak) (№ 121 ***, 131 ***). Two-room double (family, view of Alchak ) (№ 122 ***, 132 ***). Description of the room: Two-room double (a view of the Genoese fortress) (№ 116 **, 117 **, 118 **, 126 **, 127 **, 128 **, 136 **, 137 **, 138 **, 146 ** 147 **, 148 **, 212 **, 213 **, 222 **, 223 **, 231 **, 242 **, 243 **). Description of the room: Three-room triple (a view of the Genoese fortress) (№ 233 **). Accommodation of children under 5 is free. Children from 5-12 are getting a 50% discount from the main room cost, on accommodation on additional place. Meals cost (Buffet) for a child under 5 is 75UAH per day-compulsory! For every additional place with meals- 30% discount from the cost of the main place, except the cost of meals. In case of accommodation of one person in the double room, second place cost will be 70% from the main one. 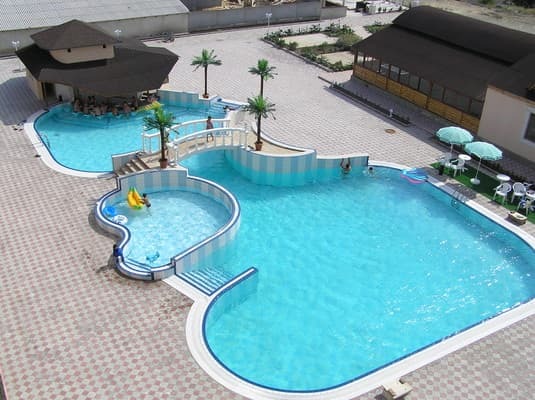 Tourist, health-improving complex "Grand" is situated in one of the most beautiful resort cities of the Crimean coast -Sudak. 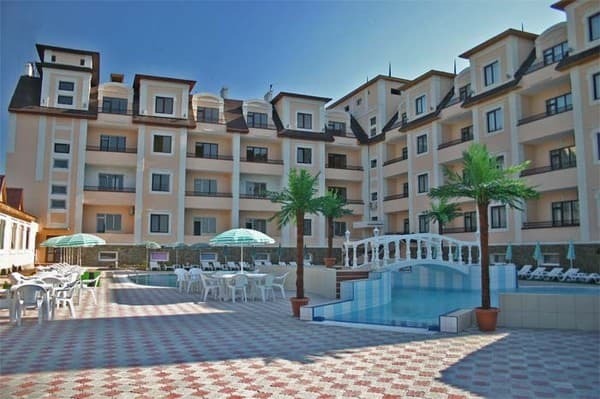 TOK "Grand" is unique in its location: 400metres from the coast of Black sea on a grief Firejnaja. From its windows, a great view is opens on Sudak and Novosvetskyju bays, cape Alchak and on the unique monument of Italian architecture of XIV century – Genuez Castle. From Simferopol by the road signs to Sudak. In Sudak by the road signs to Aquapark. Than, by the road sign on Gagarin Street “Gora Fireynaya Street, hotel “Grand””.